Frequently revived for screenings each year near Halloween, The Phantom of the Opera has come to represent the American silent film to modern audiences. With a great performance by Lon Chaney, amazingly creepy makeup (also by Chaney) and a genuinely chilling unmasking scene, The Phantom of the Opera has entered the American cultural conscience, much like Dracula and Frankenstein. This position of pre-eminence, however, has brought misconceptions. How many viewers have seen The Phantom of the Opera's static camera placements and wrongly assumed all silent movies are so unimaginatively directed? How many people have seen the insipid romance between Norman Kerry and Mary Philbin and assumed that's how romance was depicted in the silent era? Yet even with its deficiencies, which are numerous, The Phantom of the Opera is a wonderfully entertaining mystery melodrama. It's hardly great cinema in the same sense that F.W. Murnau's Nosferatu or Fritz Lang's Metropolis are great cinema, yet The Phantom charms its viewers with a great villain, great sets, and several classic sequences (such as the appearance of the Phantom at the Bal Masque de l'Opera). Now, thanks to a new Milestone Collection DVD from Image Entertainment, we can see The Phantom of the Opera in a first-rate digital transfer that restores image clarity and includes several soundtrack options. While there is no substitute for seeing The Phantom of the Opera in a grand old theater, with an organist performing the score, Image Entertainment's DVD set provides an outstanding opportunity to become reacquainted with the movie and examine its history. 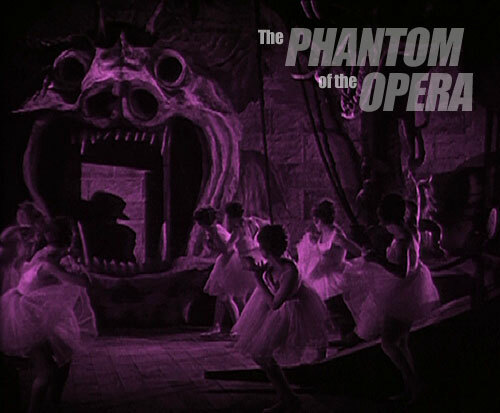 This two-disc package -- titled The Phantom of the Opera: the Ultimate Edition -- is chockfull of valuable extras that help reconstruct the movie's rocky production history, for The Phantom of the Opera went through at least five different versions, from its preview in Los Angeles in 1925 to its international sound release in 1930. Each version is different in significant ways and understanding how those differences came to be isn't exactly easy. That's where Scott MacQueen's audio commentary comes in. Unlike most DVD packages, where the audio commentary track is mostly a superficial ornament included to convince potential buyers to shell out hard earned cash, MacQueen's commentary plays a crucial role on Image Entertainment's DVD set. He spends extensive time in the commentary discussing the differences between the various versions and describing how the differences came to be. He discusses the movie's disastrous Los Angeles preview, which necessitated extensive reshooting (provided by producer Raymond Schrock and director Edward Sedgewick) in preparation for the San Francisco preview. But the San Francisco preview also went poorly. As explained by MacQueen, substantial re-editing followed, removing most of the Schrock/Sedgewick material -- with the exception of the lengthy chase sequence at the movie's conclusion. Additional reshooting followed in preparation for the movie's sound release in 1929, including the recording of dialogue sequences. An international version followed in 1930, which featured less dialog and (according to MacQueen) different camera angles. The best quality surviving print is the international version. So that's the feature on disc one, which includes a two-color Technicolor masked ball sequence, in which the Phantom appears as The Red Death from Edgar Allen Poe's tale. The set's second disc features the 1925 New York general release version. The image quality of the 1925 version is much inferior to the international release version, but it serves as a valuable document of the movie's alternative form. The set includes a photographic reconstruction of the Los Angeles preview version and a reconstruction of the many additions provided by Schrock and Sedgewick for the San Francisco preview. And the set includes audio-only excerpts of the dialogue additions to the 1929 sound version. Many of the dialogue additions were poorly executed and laughable, so it's fortunate that we aren't forced to endure them while watching the movie. Instead the audio track of the 1929 version has been edited to fit the 1930 international version, which is several minutes shorter than the domestic version. As a result, we must only endure brief bits of dialogue. The disc even provides a first rate modern orchestral score as an audio alternative (which eliminates all the dialogue). Meanwhile, the 1925 version on disc two utilizes a score performed on organ by Jon Mirsalis. MacQueen's commentary is quite good, but it's not exactly easy to keep the different versions straight as he describes them throughout the movie; and not until I'd viewed all the materials and listened to the commentary for a second time did it all begin to make sense. Even then, there is a moment when MacQueen misattributes the San Francisco preview to 1926 instead of 1925, so for the longest time I was trying to figure out whether MacQueen was referring to yet another version of Phantom. (No, he just misspoke -- and surprisingly no one caught it.) I also find it quite demanding that the only way to make sense of the various versions of The Phantom of the Opera is by listening to the commentary. Ideally, the DVD would have included a lengthy essay that would have addressed many of these issues and allowed viewers to navigate at will through various chapters of production history. Expecting the audio commentary to carry this burden is a bit unrealistic. As a result, MacQueen often speaks for several minutes at a stretch without making any reference to what's happening on the screen. Nonetheless, MacQueen's commentary is very valuable for anyone attempting to understand the mystery of the film's various incarnations. Image Entertainment and The Milestone Collection have fashioned an excellent DVD set. Whereas it's possible to exhaust the extras on some DVD sets in a few short minutes. Here you'll need several hours. Note: As evidence of the difficulties in understanding the various versions of The Phantom of the Opera, Image Entertainment's DVD packaging identifies the film on disc one as the 1929 restored version; however, according to MacQueen (in his introductory statements), it's the 1930 international version -- although during his commentary for the masked ball sequence, MacQueen says the 1930 "talking version proper" is lost and only the audio survives. I'm guessing MacQueen recorded the audio in bits and pieces, and he revised some of the information between recording sessions, leaving inconsistencies that were never fixed as the commentary segments were edited together ... so the Phantom's mystery continues. The Phantom of the Opera: The Ultimate Edition is now available on DVD from the Milestone Collection (distribution by Image Entertainment). This two-disc set includes both the 1930 restored international version and the 1925 New York release version. The 1930 version includes two soundtracks: a stereo orchestral score by Carl Davis and the original 1929 domestic soundtrack edited to fit the 1930 international version's shorter running time. 1925 version features a score performed on organ by Jon Mirsalis. This set includes several extras: audio commentary by film historian Scott MacQueen; 1925 & 1929 theatrical trailers; stills galleries that piece together deleted and missing scenes from the Los Angeles and San Francisco preview versions; audio-only dialogue sequences from the 1929 domestic version; a video interview with Carla Laemmle (by film historian David Skal); a Faust Opera extract from the 1929 Tiffany Sound Feature Midstream; and an audio-only interview with Phantom of the Opera cinematographer Charles Van Enger. Suggested retail price: $24.99. For more information, check out the Image Entertainment Web site.